Every year has its share of tragic moments. Every year we deplore that humanity has again been scarred by terrible crises that affect the lives of countless people all over the planet. Yet this year has a different taste. This year, over and above the crises and the suffering, trends that we were observing with concern have become formalised and the bedrock of humanitarian action is irredeemably damaged. From our perspective, we are collectively failing to assist victims of acute crises. The “we” includes those responsible for avoiding harm and resolving crises (states and intergovernmental bodies) and it includes those responsible for saving lives and alleviating the suffering (the humanitarian system). On the one hand, states and belligerent parties increasingly and shamelessly disregard and disrespect the legal frameworks that ensured a minimum of humanity in conflict, namely IHL and refugee law. On the other, the traditional humanitarian system is not able to effectively address the immediate needs of those caught in the worst crises and far from demonstrating a desire to address the important shortcomings in emergency response, WHS has consolidated a shift that is headed in a completely different direction. International Humanitarian Law and Refugee Law provided the backbone on which humanitarian action rested. We say it in past tense as the last twelve months have demonstrated that not even lip service is paid to them anymore. The security logic has prevailed and it is permeating it all. As a result, civilian lives are dispensable in the name of counter terrorism, refugees lose their right to asylum and patients from poorer countries can be ignored in a newly defined global health security paradigm that aims to protect the privileged ones. IHL designates medical facilities as protected spaces. 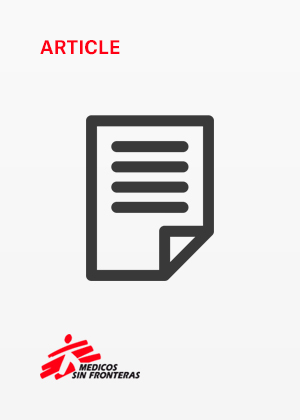 While attacks on the medical mission had been a strategy of war in Syria since the beginning of the war, the deadly attack to an MSF hospital in Kunduz on the 3rd October 2015 marked a turning point. It was the first time that a “good democracy” had attacked a hospital. The US army acknowledged the attack and brushed it off as a mistake. The world bought it, no outrage, no major ripples, no political consequences. Since then, five MSF medical services have been attacked in Yemen and dozens of MSF supported hospitals in Syria have been bombed. By now there is some outrage, but still no consequences. The topic is on the table both at UNSC and at the EU, but nothing has transpired beyond declarations of good intentions and the moment practical measures are put on the table, all states retrieve and the conversation is postponed. Attacks on medical facilities are an indicator of a more generalized disrespect for civilian life. Even the minimum respect for human life enshrined in IHL appears to be utopic in some contexts today, which results in a very reduced humanitarian space. There are striking parallelisms with what has happened with refugee law. Both frameworks, when tested against the security logic, have encountered the same fate: states unwilling to live up to their responsibilities and obligations. In the case of refugee law, 2016 is the year of the very public and unapologetic abdication of responsibilities by the European Union. With the EU-turkey deal the policy of externalization of borders has been taken one step further. The aim is clear: sealing Europe’s borders and creating a buffer zone that stops and absorbs flows of refugees and migrants. This is done by paying neighboring countries to “handle” an unwelcome “burden”, in other words, outsourcing the dirty work with full knowledge that this might involve abuse either at the hands of state security forces or people traffickers. To add insult to injury this is partly done with humanitarian funds, in other words, European humanitarian funds are used to facilitate the political objective of keeping people away. This attitude is becoming the norm, and throughout the world, wealthy countries progressively create non-permeable bubbles with the aid of walls and policies that directly reject their obligations regarding asylum of people fleeing conflict. And it is not only the EU, the US and Australia that disregarding their responsibilities towards the global displacement crisis, today Syrians are effectively trapped inside the conflict zone unable to flee towards Turkey or Jordan; the Rohingas’ are not allowed to into Thailand and Kenya has closed the Dadaab refugee camp as they are no longer willing to deal with the inconvenience. IHL and refugee law were frameworks that depended on some level of state solidarity and responsibility. Whilst we all knew that in the realpolitik world, this was often a pretend game, now no one is even bothering to pretend anymore. As the backbone of humanitarian action crumbles, a void is created that often leaves victims of conflict as unprotected as they were before these frameworks were created. One would hope that as states regress rather than evolve towards a more responsible version of themselves, the humanitarian machine would be able to scale up and respond to the emergency needs of people caught in conflict or trying to flee from it. Instead, the traditional humanitarian actors are struggling to provide effective assistance in conflict settings. The humanitarian responses to the crises in Syria, Iraq, Yemen and Nigeria are still largely insufficient and beyond the obvious security challenges, this emergency gap also responds to internal shortcomings of the system (structural, conceptual and of mindset) . Structurally, the system is monolithic with both donors and most implementing agencies articulated around the UN, and in its aim for coherence, accountability and integration it has lost agility and operational independence. Implementing actors are largely dependent on donors for funds and on the UN for logistics, security management and negotiated access. Worryingly, it often takes three months for funds to treacle down and activate the provision of assistance, and this is becoming internalized as normal. Regarding mindset, the complexity and difficulty typical of conflict settings is often met with conservatism and risk aversion. Determination to overcome challenges is often lacking and few agencies are willing (or capable) to accept failures and losses, as actors that are 100% donor dependent are understandably driven by an efficiency logic. There was an opportunity to address these shortcomings at the World Humanitarian Summit. It was the first time that the humanitarian community at large was formally invited to reflect on itself. But instead of zooming into how best to provide lifesaving emergency response to victims of conflict, the onus was on ending need. Humanitarian action was formally put at the service of development and political objectives, a move congruent with the UN-led and above-mentioned progression towards coherence and integration. This subordination of humanitarian action to development and political agendas may bring opportunities in protracted crises and recurrent natural catastrophes, but it deals a final blow to independence of action, a cost that is too hefty in our opinion. The WHS showed no ambition to improve emergency response; rather, the issue was largely skirted. The aim is to do better and more in prevention and recovery but not to do better and more in immediate crisis response. With coherence and sustainable development further reaffirmed as the compass of humanitarian action, we can only expect that the emergency gap will get bigger. The bulk of “humanitarian” action will happen further and further from those acute situations and so the conversations will naturally shift away from how to overcome the challenges to quickly assist victims of acute conflict. We are aware that the above reading is far from representative of the majority view, and we think that this is partly due to the fact that we are looking at it from a different perspective. The view point from which we observe something undoubtedly affects our perception of it. Using the imagery of a building, from the ground floor the problem is NOW and the solution simple (as well as imperfect). From this vantage point, the intensity of the moment and the fast pace of the action leaves little room for retrospective and prospective thinking. From a higher perspective time expands and the broader perspective allows for a deeper understanding. The ground floor is reactive, the tenth floor reflective. Action from the ground floor often fails to consider long term issues, and action from the 10th floor lacks speed. Both are understandable. Everybody is right, partially. MSF is a typical ground floor tenant. Most multi-mandate organizations have their point of gravity on upper floors while also trying to ensure a presence on lower ones. Many UN agencies are sieged at the penthouse. All humanitarian actors will agree that the priority in a crisis is to save lives and alleviate suffering, what varies significantly from floor to floor is the sense of urgency associated with this common mandate (some think in hours, others days, most in months) as well as the proposed actions to achieve that objective. Different actors will have different ways of prioritizing depending on the conceptual frame with which they analyze the needs. This is neither good nor bad. Just important for all to acknowledge that today, the narrative is set from upper floors, away from the smells and noise and challenges of the frontlines, hence discussions are less and less about how to overcome operational challenges to provide assistance in today’s toughest crises (i.e. NOW), and more about how to help those that will survive them rebuild their lives. Collectively the priority seems set on resilience, capacity building and ending need, and this becomes a problem when the live-saving basics remain uncovered. It is not a matter of either or, but one should not come at the expense of the other. Humanitarian action, what is left? So states have betrayed the frameworks of humanitarian action that afforded some protection to civilians and aid workers in conflict; and the humanitarian actors have progressively redefined their ambitions towards prevention and recovery and consequently made decisions to equip them for that at the cost of operational independence and emergency response capacity. The net result is a humanitarian action that can hardly respond to the very situations it was conceived for in the first place. Surely there have been good news and things well done in 2016 in the field of humanitarian action, but the elements described above are so crucial for us that we are unable to overcome this sense of pessimism regarding the fate of humanitarian action. From our ground floor perspective, the focus and ambition of the humanitarian mainstream is shifting away from the critical needs of victims of violence. And from our perspective this is not only bad news, it is the end of an era. But we cannot let this grim scenario paralyze us. Our commitment to providing lifesaving assistance to victims of acute conflict is as strong as ever, and our determination probably stronger. More than ever, we need to negotiate, renegotiate and negotiate again so that we can stretch whatever humanitarian space there is left and find ways to be present in those places where humanity seems to have vanished. At times we cannot make it and the only thing we can do is provide support from a distance. But many other times, we can. It requires taking measured risks and important investments to support complex operations. Still, the levels of suffering still vastly exceed what we can do and we can only hope that a few more organizations will make similar choices in the not so distant future. One MSF clinic, three MSF supported hospitals and one ambulance.